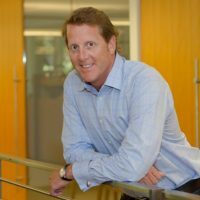 Barry Eggers (’85) is a founding partner at Lightspeed Ventures, a venture capitalist firm which focuses largely on IT and Technology start-ups (If that name rings a bell, it is because a few years ago they seed funded a little known company called Snapchat). What most don’t know is that his journey, which led him to Silicon Valley, started in Westwood. At UCLA, Eggers majored in Economics Business and loved the subject. An athlete at heart, Eggers was a part of the NCAA Men’s Water Polo team, fondly recalling their experiences competing against other PAC 10 schools. Aside from this, he was a passionate UCLA football fan and a member of the Sigma Alpha Epsilon fraternity, where he cultivated his social circles. As such, he often found himself working with small, dedicated teams since his college days. After graduating from Stanford Business School, he joined Cisco. Cisco, at the time, had recently gone public and was still in its infancy. He watched as Cisco grew from 400 to 12,000 employees, and loved working in different roles as the company grew; it felt like he had a new job every year. However, as Cisco grew larger, Eggers missed the intimacy and excitement of working in a smaller and dynamic environment. The venture capital world was, quite literally, calling. After leaving Cisco, he founded Lightspeed Ventures and began working with small start-ups. He loved the feeling of discovering a company and watching the journey it made. These were risky ventures and no one knew where a company would go. However, this was really exciting for him, because he never knew where the next great journey would come from. Rather conveniently, he discovered Snapchat in his home when he saw his daughter using the app with her friends. This sparked Barry’s interest, and he talked to his partner Jeremy Liew. After Jeremy tracked down Evan Spiegel, Lightspeed became Snap’s first investor. Since then, Barry has watched Evan Spiegel grow from an aspiring 21-year old entrepreneur at Stanford to the CEO of an emerging social media powerhouse. Eggers recalled that something like this was virtually impossible when he was still in school: the word “entrepreneurship” did not exist. He describes how back in his time, you would graduate college, get a job, and climb the corporate ladder. Now, the opportunities are limitless, and he is actively trying to bring these opportunities to UCLA students. Lightspeed Ventures sponsors StartUp UCLA. Eggers himself endowed an annual seed fund prize for UCLA teams, and is a driving force of the entrepreneurship minor. He believes that college is a great place to learn interpersonal skills, that in order to succeed in Silicon Valley you must get familiar with the ecosystem. The VCs, angel investors, consumers and directors present in Silicon Valley act as catalysts for success to anyone who can adapt to the system. UCLA, much like Silicon Valley, is an ecosystem ripe with opportunities. Anyone who takes advantage of these opportunities will walk out with a set of interpersonal skills and experiences that will help him or her succeed anywhere in the world. His parting advice would be that you never know where life will take you and where you will end up. He never thought he would be working as a VC. However, if you work at a growing company that you are passionate about, you are sure to move forward and end up somewhere you like. You never know, but one fine day, you could discover the next Snapchat.